In Composition with Labyrinth and Nautilus the Nautilus shell plays a central role. By similarities in form and line-pattern the shell refers to the labyrinth, which has a very intriguing form. It differs from a maze in that it only has one complex and convoluted path one can follow - like the labyrinth of Antiquity. This labyrinth with a diameter of 12 meters is located on the floor of the Gothic cathedral of Chartres (France). In order to reach the main altar one first had to ‘walk’ the labyrinth. While doing so, one could not lose one’s way, as the path always leads to the centre, which portrays heaven or Jerusalem. As you may understand by now, this labyrinth stands for the journey of life which, even though it may contain detours, is certain to lead to the goal. The form of this labyrinth is also special. There are eleven concentric circles; eleven, an imperfect number, not ten (decimal system) en not twelve (apostles) either. In this circular pattern the thick blue lines form a cross. When going through the labyrinth, one keeps on hitting upon this cross, where one has to turn around and change one’s direction. This symbolism afforded the Christian visitor the opportunity to ponder one’s own path through the sinful world and to direct one’s steps time and again towards the heavenly Jerusalem. Shuffling across the pattern on the floor, one prayed and asked forgiveness for wrong turns taken. In order to do penance one could also go through the labyrinth on one’s knees. We could say that the blue labyrinth stands for the world – that is how it is meant in this composition. Central within this figure is a Christ monogram, in which the I of ‘Iesous’ and the X of ‘Christos’ have been joined together in extreme abstraction to form a kind of star. Perhaps this is not the most well-known, but definitely the most widespread and oldest (11th century) Christ monogram. Furthermore early forms of life like stone, fossil and shell have been incorporated in the woodcut, while the word ‘eschaton’, to the left of the labyrinth, refers to the end of time. The block letters refer to written words (culture and the Word) and the numbers make one think of number symbolism. The Christ monogram in the centre of the labyrinth/the world calls to mind the medieval image of Christ as the Pantokrator or ruler of the world. This is the heart of the composition. Finally the orange and red colours endow this print warmth, love and life. 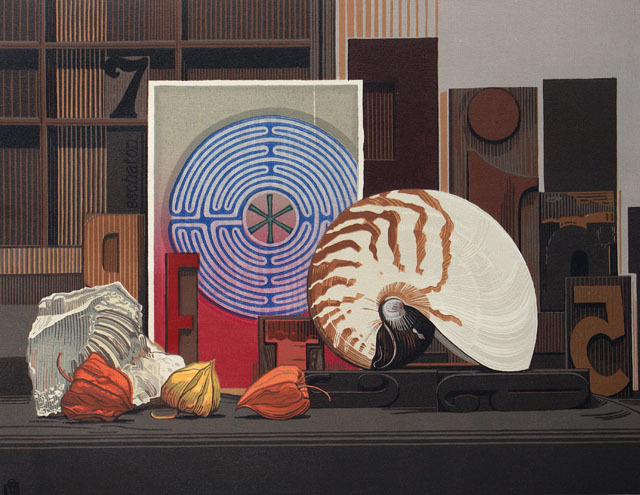 André Pelgrim: Composition with Labyrinth and Nautilus, 2009, colour woodcut, 39 x 50 cm, printed on 300 GRS Hahnemuller. André Pelgrim lives and works in Vlaardingen in the Netherlands. He mainly makes woodcuts. In the Fall of 2010 a topographical book about Vlaardingen will come out to which he has made an important contribution. In the Fall, there will also be an exposition of the works he made for this book.